‘Explosion! Concussion! The vault doors burst open. And deep inside, the money is racked ready for pillage, rapine, loot. Who’s that? Who’s inside the vault? Oh God! The Man With No Face! Looking. Looming. Silent. Horrible. Run… Run…’ This is the way ‘The Demolished Man’ opens. 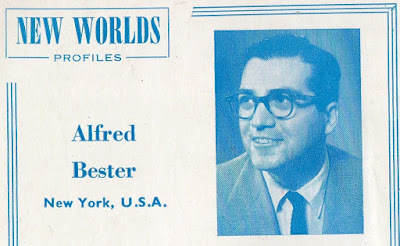 Yet ‘(I) am not at all glamorous’ ventures Alfred Bester in ‘Hell’s Cartographers’ (1975), ‘merely a working stiff.’ And his photo in his ‘New Worlds’ writer-profile (no.29, November 1954) almost fools you into believing it. He presents a clean 1950s TV-sitcom image, short disciplined dark hair, heavy tortoiseshell-rim spectacles, ignited by a cheesy smile. Suggesting the slick prose-style of a Madison Avenue ‘Mad Man’ advertising copywriter. And yes, he was very much a working writer, across several genres, quoting Galsworthy as an aspirational model. 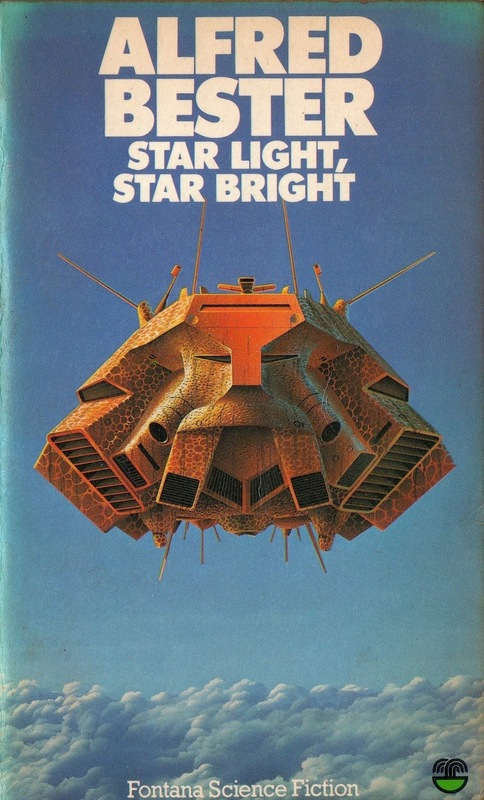 Nevertheless, the history and the greatest hits of this working stiff conveniently spans two short story collections – ‘The Light Fantastic’ (1977) and ‘Star Light, Star Bright’ (1978), forming a cosmic-bridge from 1941 to 1975. The Best of Bester. 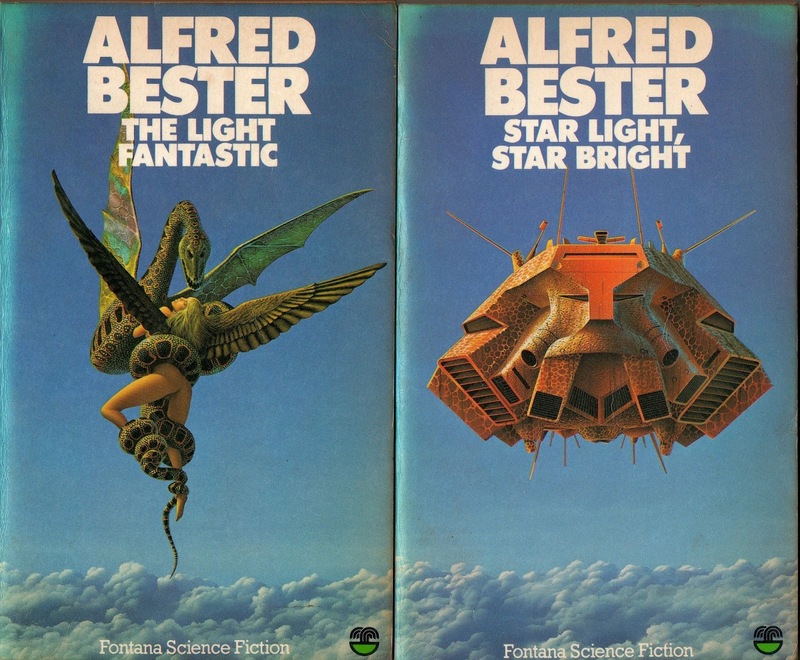 Published in Britain as companion volumes by Berkeley/ Putnam bracketed as ‘the great short fiction of Alfred Bester’, in the States they were available as a single omnibus edition from Nelson Doubleday through the SFBC. Bester himself confides ‘I always dismiss my past and concentrate on the present and future. As a result I don’t remember three-quarters of the things I’ve written, and certainly not the dates of anything.’ So, if a modicum of effort has gone into their compilation, the effort has been well worthwhile. 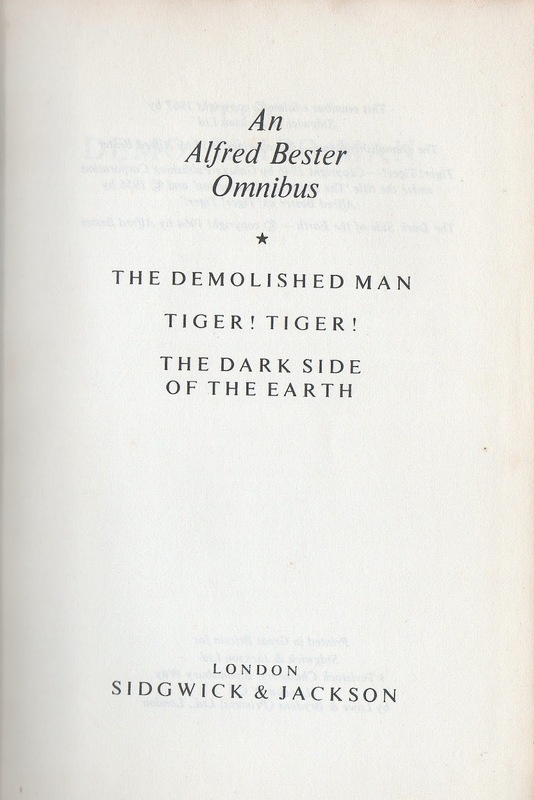 Although never over-prolific – with nineteen years between the publication of his novels ‘Tiger! Tiger!’ (1956) and ‘Extro’ (1975), this one-time scripter for the ‘Green Lantern’ and ‘Captain Marvel’ comic-books and syndicated strips, the ‘Charlie Chan’ radio-detective slot, and ‘Fred Astaire’ TV-shows, has steadily produced an ornately impressive body of work glittering with hard bright images. Herewith the short story collections are interspersed with anecdotal accounts of his life and the incidents – when recalled, that sparked off the stories, rather after the style of Isaac Asimov’s interminable reminiscences. 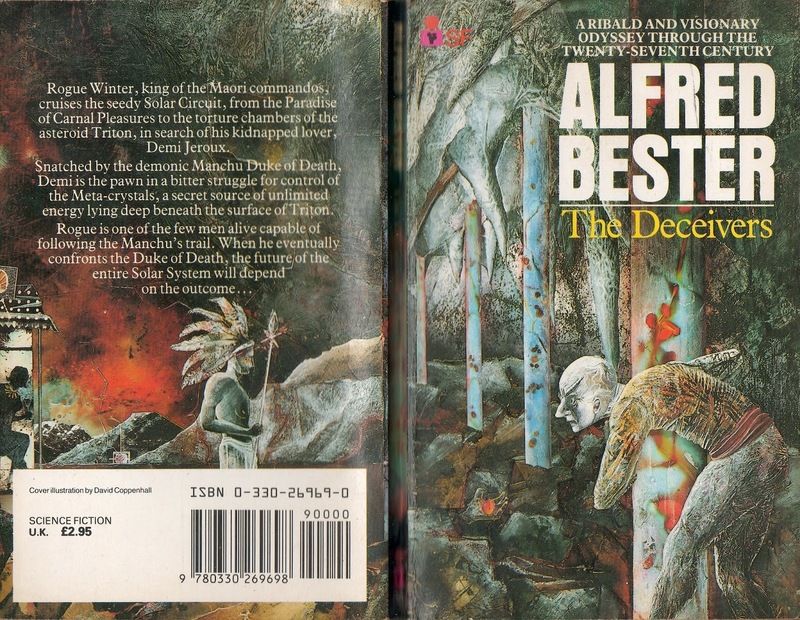 The second book also reprints the hefty chunk of autobiography “My Affair With Science Fiction” lifted intact from Brian Aldiss’ invaluable ‘Hell’s Cartographers’, in which a constellation of writers trace their careers back to their origins, and in which Harry Harrison calls Bester ‘one of the handful of writers who invented modern science fiction.’ Well, maybe. 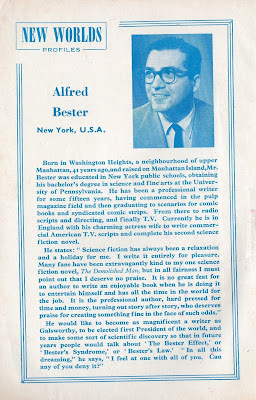 Of his own beginnings – born in the Washington Heights neighborhood of upper Manhattan in 1913 to liberal first-generation American parents of Austrian of Russian Jewish extraction, Bester was ‘raised and trained’ in what he terms the ‘American School of the Unexpected’. ‘I’ve loved it (SF) since its birth. I’ve read it all my life, off and on, with excitement, with joy, sometimes with sorrow.’ Among the tomes he devoured and digested were garish early issues of ‘Amazing Stories Quarterly’, alongside HG Wells, Stanley Weinbaum’s ‘A Martian Odyssey’ (1934), AE Van Vogt’s ‘Slan’ (1946) and Robert A Heinlein’s “Universe” (in ‘Astounding SF’, May 1941) – as well as ‘reading and annotating James Joyce’s ‘Ulysses’’. 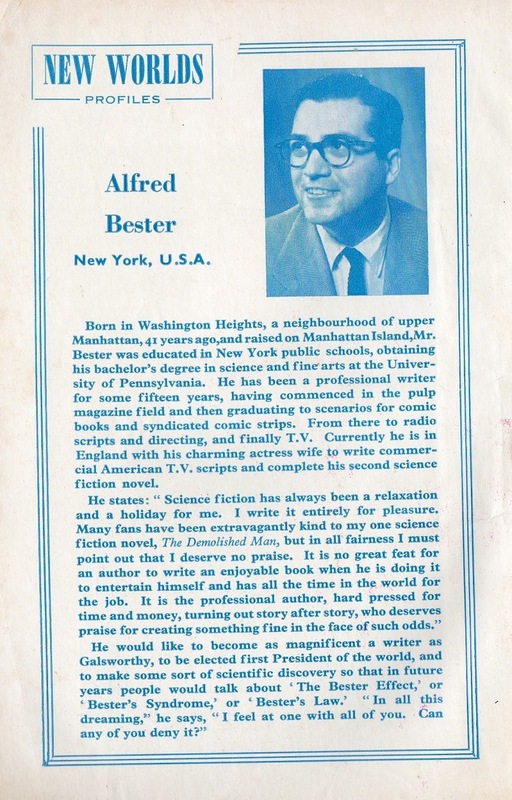 All were influences, from which the tyro Bester evolved his own fiction style. In 1938 – aged just twenty-five and still a law student, he was contrived into winning a $50 amateur-SF contest, that resulted in his first sale, “The Broken Axion” to the lurid fifteen-cent ‘Thrilling Wonder Stories’ (April 1939), accompanied by an uncredited ‘Meet the Author’ blurb. Promptly turning professional, further sales to editor Mort Weisinger’s magazine rapidly follow, such as “The Voyage To Nowhere” (July 1940), and the ‘Startling Novelete’ “Slaves Of The Life-Ray” (February 1941). He soon expanded into Frederik Pohl’s ‘Astonishing Stories’ (February 1941), with his “The Pet Nebula” earning him cover status. His eventual acceptance into John W Campell’s market-leading ‘Astounding SF’ came with “Adam And No Eve” (September 1941), which is collected into ‘Star Light, Star Bright’. 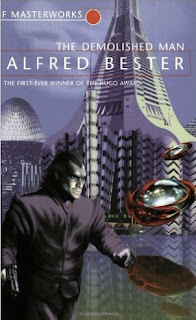 ‘Alfie’ himself considers this to be ‘the first of my ‘quality’ science fiction stories. I put ‘quality’ in quotes because I think it’s rather jejune.’ Even selecting a word such as ‘jejune’ to describe its essential lack of originality demonstrates a certain stylish flair. And yes, eschewing the soon-come flood of Cold War post-apocalypse tales – this was still 1941 after all, the story does now appear melodramatic, overwrought and cliché-ridden. Steven Krane is so mesmerized by the beauty of the rocket-ship in which he intends to become first human to circle the Moon, that he ignores warnings about the hazards of the experimental fuel he’d using. As he blasts off – taking his dog Umber with him, it ignites a destructive chain-reaction, so that as they parachute back to Earth, it takes them into a dead world of ash and suffocating dust. Hallucinating conversations with his dead colleagues, forced to fight and kill a maddened Umber, this last man alive reaches a ‘terminal beach’ where he comes to a dread realization of ‘what had brought him back to the sea. There need be no Adam – no Eve. Only the sea, the great mother of life was needed. The sea had called him back to her depths that presently life might emerge once more…’ The organic matter of his dead body will kick-start a new evolution, with the implication that this extinction event is part of an eternally recurring cycle. “Adam And No Eve” was included among the eleven 1941-1954 stories gathered into an earlier collection – ‘Starburst’ (Signet, 1958), some of them showing thematic or technical limitations. 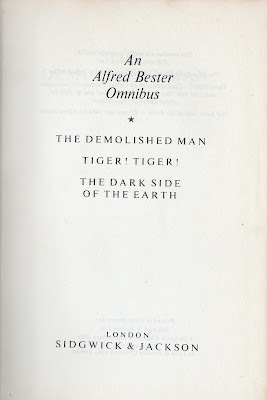 With regard to elaborating the finer detail of such stories, Bester’s comments are irritatingly vague, he instead prefers to conjur entertaining pastiches on the next phase of his career. From 1942 – after thirteen SF short story sales, he became heavily involved in the comics industry, and scripting for radio while simultaneously churning out workable scripts for TV’s juvenile ‘Tom Corbett: Space Cadet’. Arguably the tight formulaic discipline involved strengthened and encouraged his plotting dexterity. 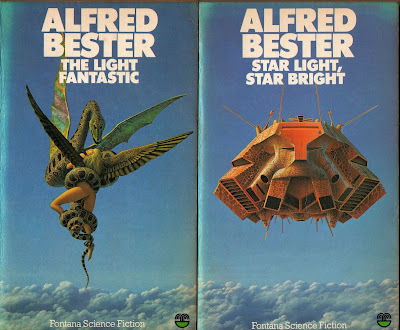 During this freelance sojourn he retained his Science Fiction links by doing book reviews, before returning to SF-proper through sales made predominantly to Tony Boucher’s ‘Magazine Of Fantasy & SF’. And the evolution is very much in evidence. 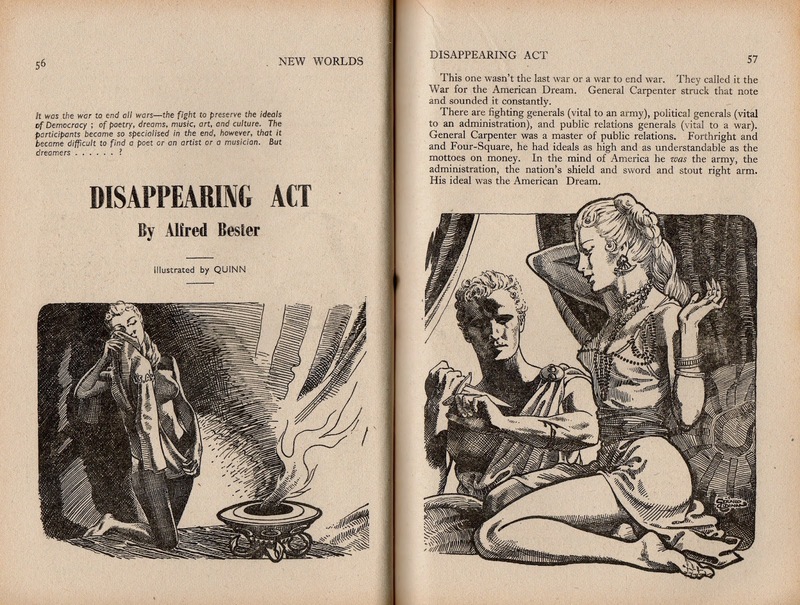 “Disappearing Act” from ‘Star SF Stories no.2’ in America and ‘New Worlds’ (no.29, November 1954) is an elaborate political metaphor on the manipulation of patriotism. Although set in the year 2112AD, it is as applicable to Vietnam as it is to the coalition’s intervention in Iraq. Editor John Carnell sets the theme within ‘the war to end all wars – the fight to preserve the ideals of Democracy; of poetry, dreams, music, art and culture.’ So what is the secret of Ward T in St Albans hospital? Are the supposedly-recuperating war-casualties time-travelling? No, they’re retreating into fantasy past-ages of their own creation. To Carnell ‘the participants became so specialized in the end, however, that it became difficult to find a poet or an artist or a musician. But dreamers…?’ Witty and sharply concentrated, the writing is slick and sophisticated, in a genre where most stories are neither. From the tail-end of this phase comes another of his masterpieces – “Fondly Fahrenheit” (‘Magazine Of Fantasy & SF’, August 1954, much reprinted, including in ‘The Light Fantastic’). Breathlessly fast-paced, the stylistic invention in this story of a serial-killer android is particularly impressive for its period. The multiple-aptitude android has its ‘prime directive’, which is violently overridden in high temperatures, hence the story title. With Vandaleur, its owner who shares its complex ‘projection’ identity, they flee across the galaxy from world to world, starting on the rice-fields of Paragon III, until arriving at Earth for a showdown in frozen Scottish marshland. Their interlocking consciousness and overlapping identities legitimize startling mid-paragraph shifts in narrative perspective, from third singular, first plural, first singular, third plural – all within the span of fifteen words! A jolting displacement device both disconcertingly effective and perfectly explicable within its context. This dance of words is accelerated by using a nonsense-song ‘be fleet be fleet’ as a recurring motif, ‘so jeet your seat’ becomes as much a punctuation as the end-of-section temperature read-outs. While anthologizing the story Robert Silverberg oozes superlatives for ‘how quick and supple the prose, how sparkling the dialog, how agile the leaps and pirouettes of the plot!’ adding ‘dazzle has always been Bester’s stock-in-trade’ (in ‘Robert Silverberg’s Worlds Of Wonder’, Victor Gollancz, 1988). As Bester’s development continues, he writes intriguingly of his first encounter with the legendary John W Campbell Jrn. Under the pretext of discussing a Bester ‘Astounding SF’ contribution (the Freudian “Oddy And Id”), Campbell instead attempts to propagate his fad for L Ron Hubbard’s loony-tune ideas. 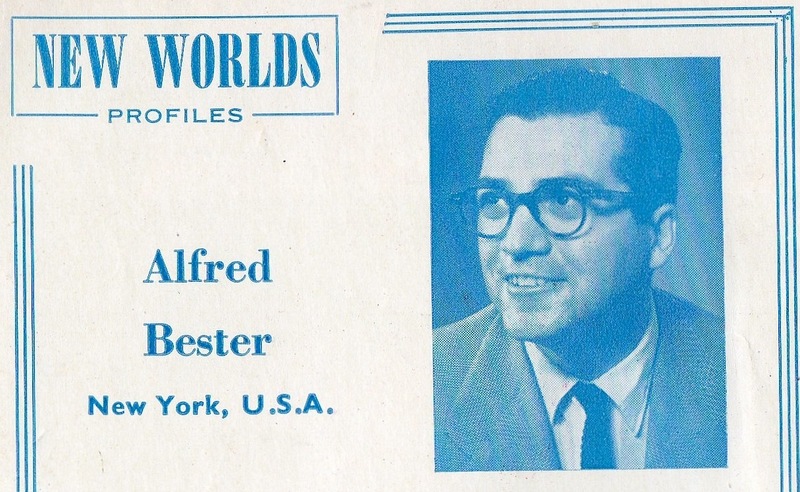 In fact, it was Dianetics that prompted Bester to seek alternate editors. Such anecdotes are never less than fascinating, almost compensating for the occasional desire that Bester would slow down and concentrate on the actual details of crafting his stories. Horace Gold, for example, was apparently instrumental in assembling the ideas that eventually went into his 1953 Hugo winning debut novel ‘The Demolished Man’ which Gold first serialized in three parts in ‘Galaxy’ (January, February and March 1952). Centering on twenty-fourth-century psi-enabled Espers operating within hugely powerful corporations and guilds, it is also a murder-mystery with psychic detective Lincoln Powell tracking criminal Ben Reich through a hard-edged labyrinth of mind-games. If the psychological edge to Powell’s obsessive drive is sharpened by Manhattan Freudian Analysis – ‘my habit is to look at characters from the Freudian point of view first’ admits Bester, it is also seamlessly embedded in pyrotechnical pacing, wielding an assured dexterity the envy not only of young wannabe pretenders, but of seasoned veterans. 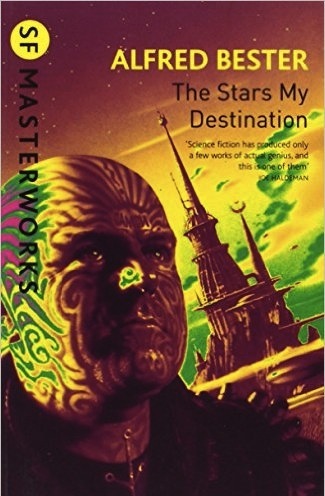 Indeed, some genre academics have traced the novel’s experiments with typefaces and the juxtaposition of telepathic and non-telepathic dialogue, as a precursor to cyberpunk, although – as a critical Michael Moorcock points out about ‘Tiger, Tiger’ ‘for all its experimentation’ it ‘used a tried and trusty plot as a basis for the experiments.’ Maybe such an approach is an essential sweetener for groundbreaking innovation? For Bester certainly constitutes a bridge across the gulf between the old and New Wave styles of SF. 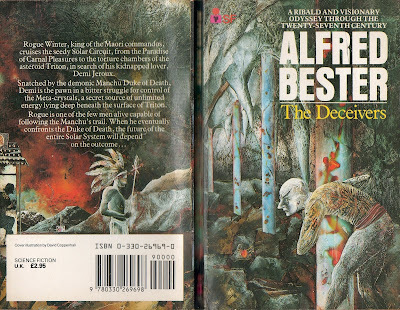 Brian Aldiss is more generous in applauding Bester’s ‘sparkling and aphoristic’ writing that ‘lent courage to many who were rejecting the older mood of grey realism’ (introducing “Time Is The Traitor” in his ‘Space Odysseys’ anthology, 1974). It would also appear that many of the short stories of the time were spun-off from the novel’s core. But Bester himself does not elaborate. 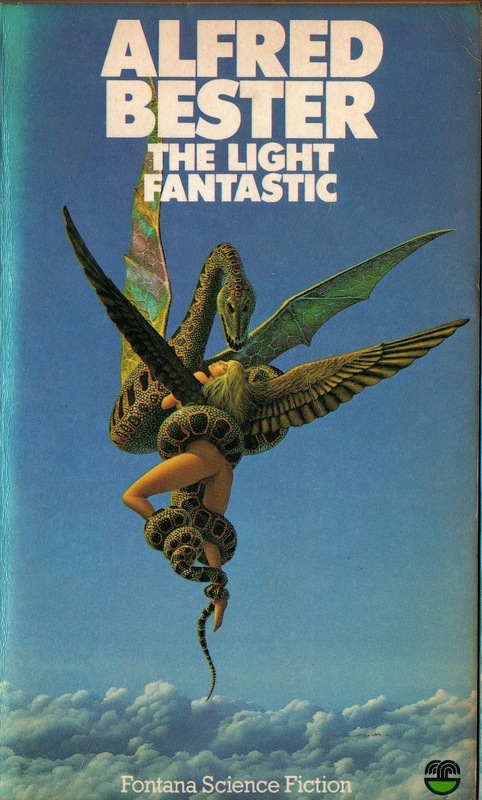 The brilliant “The Men Who Murdered Mohammed” for example (‘Magazine Of Fantasy & SF’, October 1958, and UK ‘Venture SF’, April 1964, then ‘The Light Fantastic’), is one of a number of Bester variations on the problems of Time Travel. The story is at once an extended joke, and a beautifully constructed piece of narrative. ‘He was running out of ammunition’ it reads, so ‘he opened a fresh box of cartridges, went back in time and massacred Christopher Columbus, Napoleon, Mohammed, and half-a-dozen other celebrities’! There’s something of the ‘Starburst’ ‘sadistic time-travellers out for cheap excitement’ about the passage, and the almost punchline-ending in which the temporal genocide preserves present-time unchanged but destroys the protagonist, is handled with perfectly understated humor. There was a further break while he filed regular monthly features for ‘Holiday’, until the magazine folded in the 1970s. By now the book-jacket photos show him more acceptably bearded, a creator, a craftsman not just a ‘working stiff’. 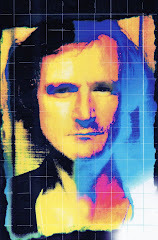 Meanwhile, these two volumes of stories spin out a career stretching across forty years – from the faltering early shots such as “Adam And No Eve’, through to the later stylistic experimentation that grew out of the ironic New York flash and wit of “Fondly Fahrenheit”, such as “The Four-Hour Fugue”. 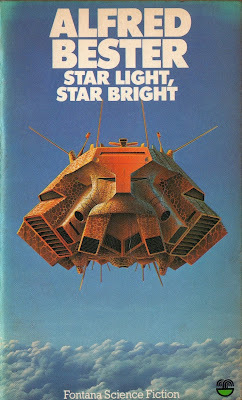 And as an added bonus there’s Bester as critic in ‘Star Light, Star Bright’, writing on ‘Ike’ Asimov, and then tracing the unusual contours of his own career. The history of Alfred Bester is the history of one of American Science Fiction’s most unique writers.